It’s not surprising that someone who owns her own floral design studio—Munster Rose—is attuned to the natural elements. But the light wasn’t the only thing that appealed. She also fell in love with the crisp, white painted woodwork, the French doors leading from the dining to living spaces, the dining-room bead board, and the piano windows in the living room and above the stairs. She and her husband, Mike, tore up the carpet, repainted all the rooms except for the living room’s cool neutral gray-green, and installed a cooler in the basement for her flowers—where her floral design business flourished. 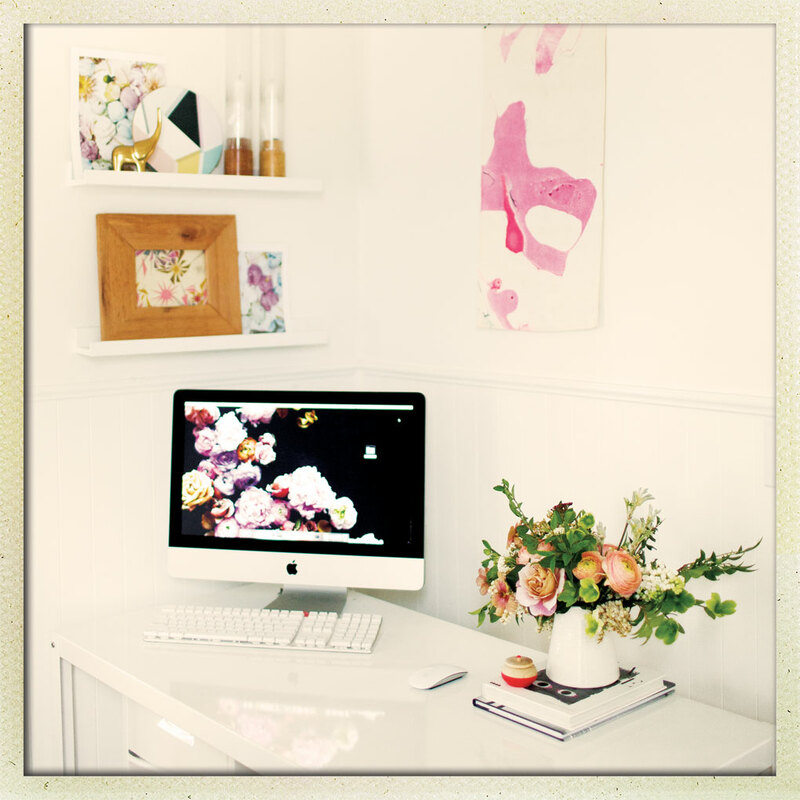 Her home office in a corner of the dining room features her favorite pastel palette. 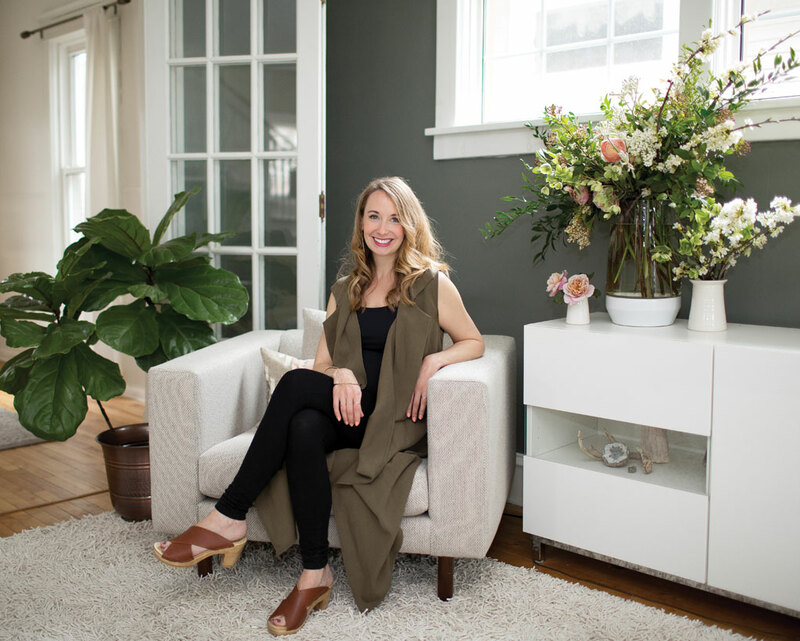 Reisenauer called on her interior design education from the University of Wisconsin, Madison, to pull together a home that feels effortlessly organic and natural. “I’m intentionally eclectic,” she says. “I don’t throw just everything together—it has to be stylized and thoughtful.” Indeed, sleek modern pieces coexist harmonically with midcentury ones, antiques with Ikea. It’s the same type of layering, depth, and movement that she applies to her natural, unforced floral designs. “It’s much more fun and satisfying to design this way,” she explains. 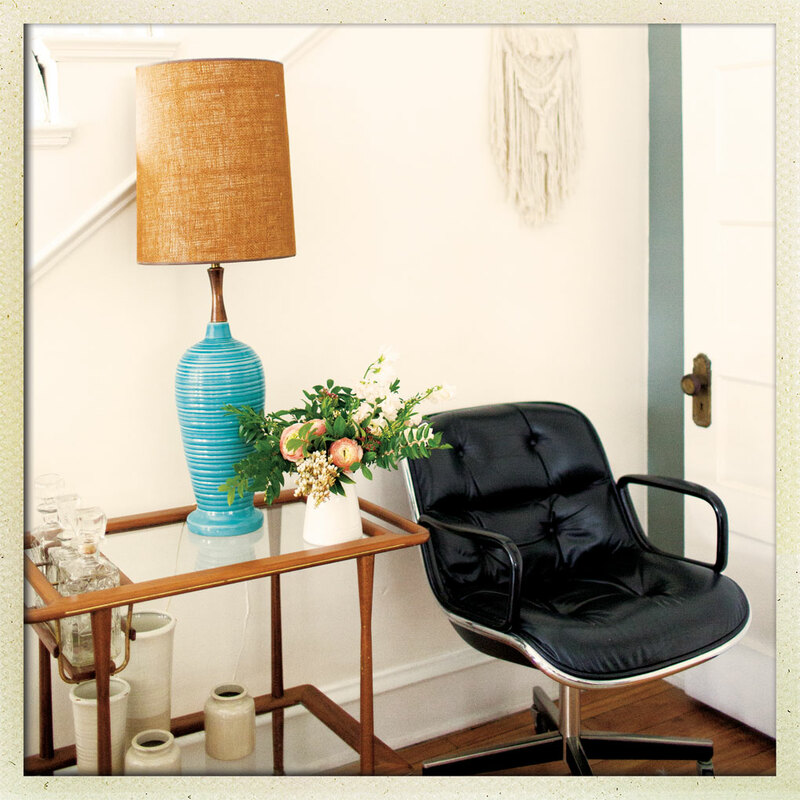 A midcentury lamp is right at home next to one of her treasured Knoll chairs. Her sophisticated color palette—gray, white, cream, luggage-leather brown, sage, and hits of peach—is as lovely as her floral designs. She punches up interest with texture: Shag, tweed, leather, and knitted textiles are punctuated with geodes, agates, vintage lamps from her father-in-law’s collection, and ceramic and acrylic finishes. She mixes her intricate blooms with minimalist, neutral, geometric vases. 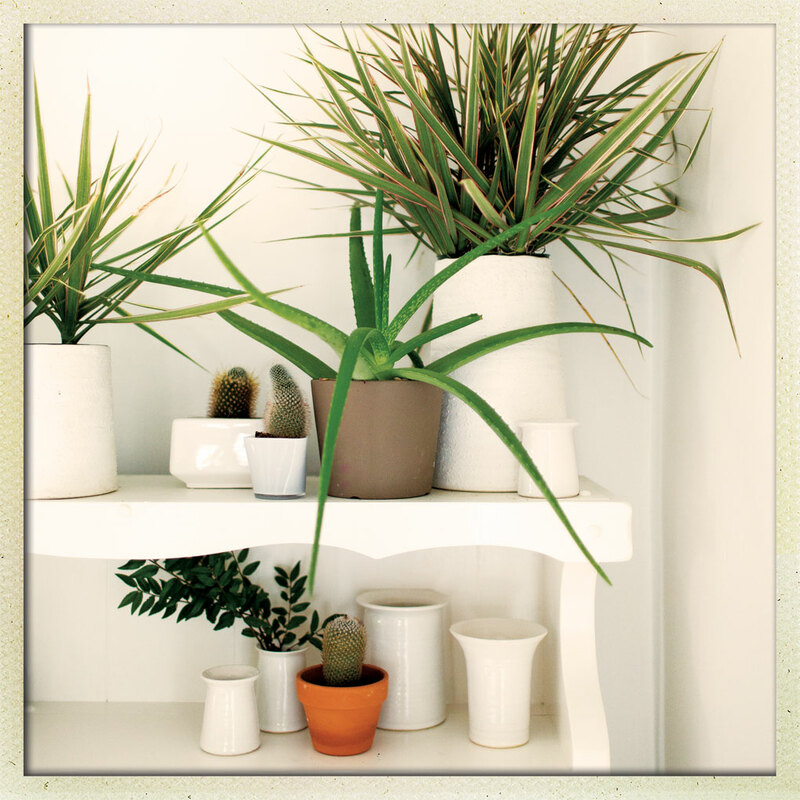 The dining room buffet holds houseplants and a selection of the Kindred white clay vases she designed with Doug Trott of Prairie Garden Farm Pottery. After filling the house to overflowing with flowers, Munster Rose moved to its own space in St. Paul’s Vandalia Tower, where Reisenauer designs for events and hosts floral workshops and trainings. Now, she can design her home to better accommodate her blooming family, trusting her instincts and experience to guide it all. Definitely my pair of Knoll chairs. They were a major find at a thrift shop that’s no longer open on the Minnehaha Mile. I got them for $20. What does a dream day on the town look like for you? The Bachelor Farmer, and have a decadent dinner at Bar La Grassa. What’s an easy way to incorporate more floral in our homes? Experiment with foraging right in your own backyard! Any green [can make a statement]. Lilac foliage will last for weeks in a vase. Rosemary lasts forever, too. I’ve even cut branches—from tiny shoots to a major piece—from an oak tree for arrangements and installations. What’s an essential ingredient in your style? As a small business owner, I also want to support other small business owners. I’ve bought so many handmade pieces, and love the handmade element, from art to a fruit bowl to throw pillows.